Based on a number of trip reports and articles I’ve read over the years on several different sites, it seems that when destination visitors fly into Spokane, in all likelihood they’ll be heading due north to access the highly regarded lift-served, cat- and heli-skiing in British Columbia’s southern Kootenays. Given the quality of the terrain and snow up there — and equally important, the expensive airfares into the airports on the other side of the border — it’s understandable. That said, as an adherent to the law of contrary public opinion, I’ve always been equally interested in the mountains on the U.S. side, so last March my wife and I went on a week-long ski safari mixing one-day visits at a handful of entertaining day areas (Mount Spokane, Lookout Pass, 49° North) with three days at the region’s destination resort: Schweitzer Mountain. Residents are well aware of how good the skiing is in their part of the snowsports universe and will enthusiastically tell you so when given the opportunity. No surprise then that they often scratch their heads at why more long-distance visitors don’t give it a test drive. So here you go; I’m putting in a couple thousand words for the low-hanging fruit found in eastern Washington and the panhandle of northern ID: also known as the Inland Northwest. Before we get on to the business at hand, first some praise for the Spokane airport, which offers a rapidly disappearing feature at even medium-sized airports these days — rental car counters as well as the cars themselves literally steps from the luggage carousels. Within 20 minutes of landing, we were on the road: a rare feat these days. Thanks to the three-hour time difference, we were looking at an atypical, but highly valued feature of destination trips: arrival-day turns. 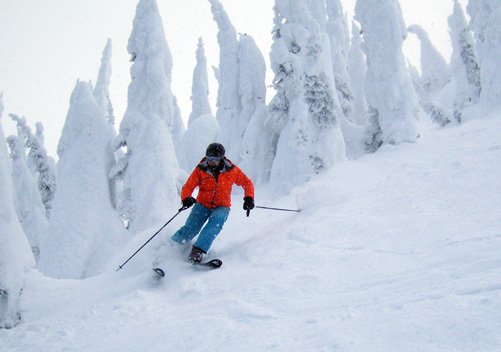 Our first destination was Mount Spokane, a nonprofit ski area about 45 minutes from the airport that features 2,000 vertical feet, fun and varied terrain, reasonable prices, and night skiing four days a week. Given the convenient location, it’s a favorite for Spokaners who want to zip up for a quick fix of legitimate turns without a long drive. The skies were deep blue on the way up, but a few minutes before arriving, we drove into a storm circling the mountain, drastically reducing visibility. In the three hours we spent there brailling our way through snow squalls, Mount Spokane’s rolling cut trails, great tree skiing (a recurring motif of this trip), and comfortable hometown vibe in the lodge impressed us. 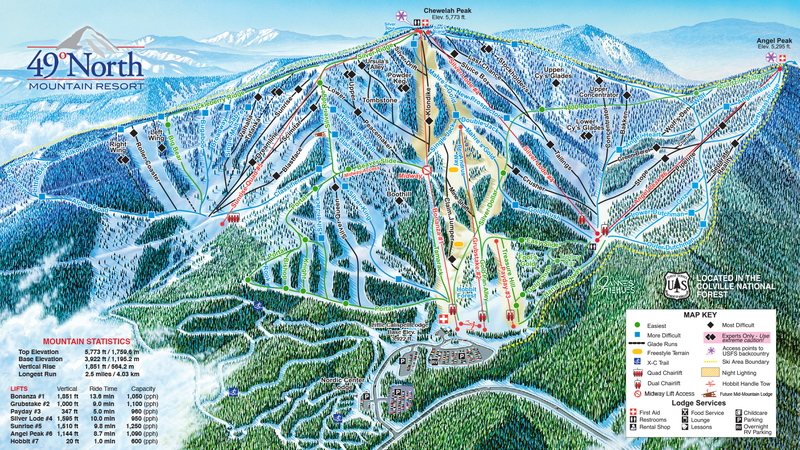 Although the existing trail map does a poor job of conveying the scale of the terrain, I was told that ski mountain artist extraordinaire James Niehues had been commissioned to paint a new map. Vintage lift freaks should make a point of stopping at Mount Spokane for the five nicely maintained Riblet chairs from the late 60s, which is appropriate because Riblet (at one point, the largest ski chairlift manufacturer in the world) was headquartered in Spokane and installed reportedly the world’s first double chairlift at the ski area in 1946. 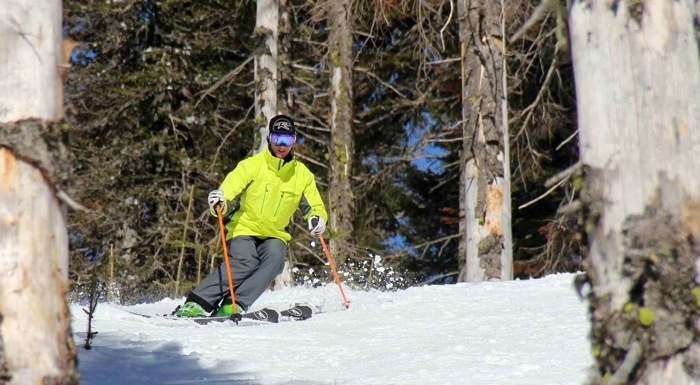 Everyone was excited about the news that they had purchased a used chair (yes, another Riblet double) from fellow nonprofit Bridger Bowl to access 80 acres of north-facing terrain covering 1,600 vertical feet, including seven trails and additional glades. Unfortunately for those who were hoping that the lift would be in service during the 2013-14 season, a local environmental group appealed to the Superior Court against the expansion, which will cost the ski area an additional six to eight months to prepare a new Environmental Impact Statement. In any case, I’d love to go back to Mount Spokane under better weather conditions, and with recent renovations to the lodge, including an internet cafe and new restrooms, it’ll be even more user friendly. It’s a “mountain less traveled” that’s, oddly enough, closer than any other ski area to the region’s airport. After skiing a classic off-the-beaten-path hill, we drove a couple hours to the very pleasant community of Sandpoint, Idaho. 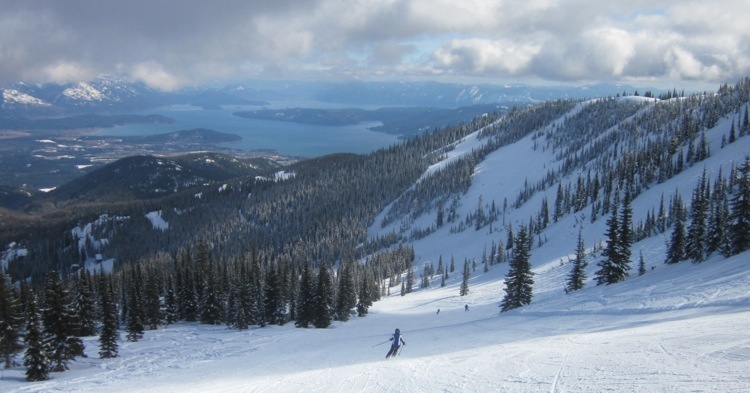 For what it’s worth, Sandpoint was one of USA Today’s 2011 five best small towns, but more importantly, it’s home to Schweitzer Mountain, a resort with big-league stats: 2,900 skiable acres, 2,400 feet of legit vertical, more glades than you can shake a ski pole at, stunning views, lots of elbow room, and a pleasant base village with slopeside condo/hotel accommodations. The previous day’s storm had left nine inches of dense snow and a fair amount of residual fog, but with plenty of trees surrounding the cut runs to help with orientation, vertigo wasn’t an issue. We spent most of the day getting our bearings on the front side, where there were plenty of consistently pitched blue squares, with the terrain getting progressively steeper the further you traversed to the skier’s right of the Lakeview triple lift. The next day dawned with a complete inversion keeping us above the clouds, allowing us to see Schweitzer in full color, with views that can only be described as “wow.” While a fair number of locals had driven up from Sandpoint to get at the leftovers from the storm, you’d never know it from how deserted the mountain felt. At opening bell, I met marketing coordinator Sean Briggs and we rode to the top of the mountain and down the scenic and aptly-named Great Divide trail, which separates Schweitzer’s front and back sides and is lined by a number of “snow ghosts,” a frequent phenomenon in this part of the country. He then took me on an end-to-end tasting menu of the mountain’s back side, the gorgeous Outback Bowl, home to a stunning array of terrain shots: everything from treeless steeps at the top and tight, powder-choked glades around the sides to a number of beautiful, long groomed runs covering the entire advertised vertical drop. While riding the chairs, I learned some of the resort’s history. It’s allegedly named after an enigmatic Swiss loner who lived at the bottom of the mountain (Schweizer is the German word for “Swiss” and a “t” was added to help Americans pronounce it properly). 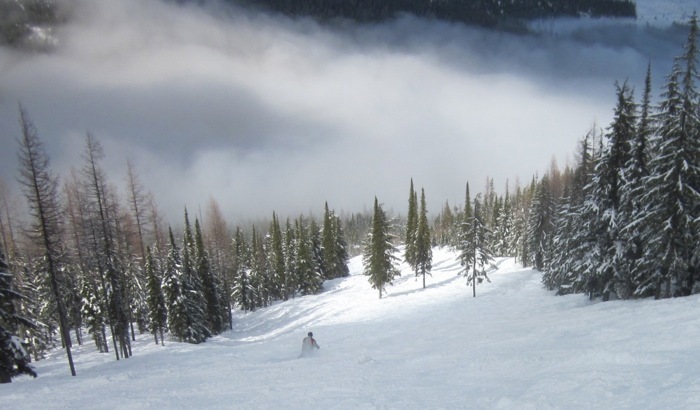 Schweitzer is located entirely on private land that was once owned by a timber company, which enabled the resort to expand without the usual messy federal and state environmental roadblocks that most mountains in the west have to contend with. According to some locals, this turned out to be a double-edged sword, as it could be argued that the resort may have grown a bit too quickly given the limited amount of ski days the region was capable of generating. Although Schweitzer wouldn’t get many votes for a Top Ten badass mountain, it’s hardly lacking in challenge. That said, I’d instead rank it as one of the best all-arounder ski areas in North America; one that would certainly get more attention if it were located near a more heavily populated part of the country. Despite all of its attributes, the mountain’s main clientele is locals and drive-up audiences within a six-hour radius; however, based on our very positive visit, I’d highly recommend Schweitzer to fly-in visitors. After three days at a mountain that we couldn’t have skied out in five, our next stop was a ski area whose terrain stats, especially for the western part of the country, are comparatively modest: a 1,150-foot vertical drop and 540 skiable acres. 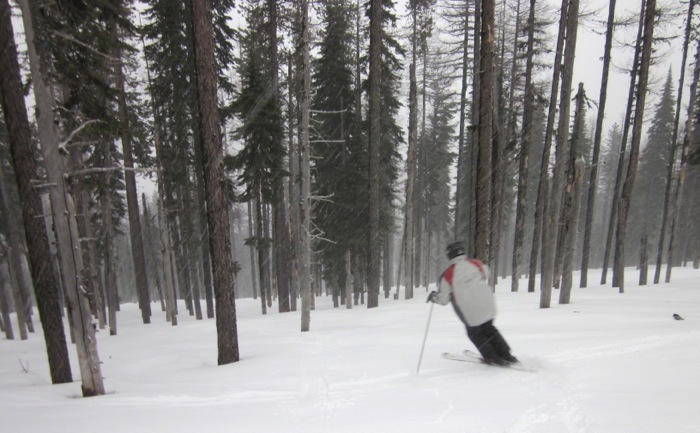 Although Lookout Pass has a number of enjoyable short single-black trails and some gorgeous tree skiing, its one superlative is an average of 400 inches of natural snow per year — giving it a legitimate claim for the best lift-served conditions in the Inland Northwest region (i.e. no need for snowmaking and early openings during most years). Take a look at this video for a taste of what it’s like to be there on a powder day: just enough pitch for effortless turns. 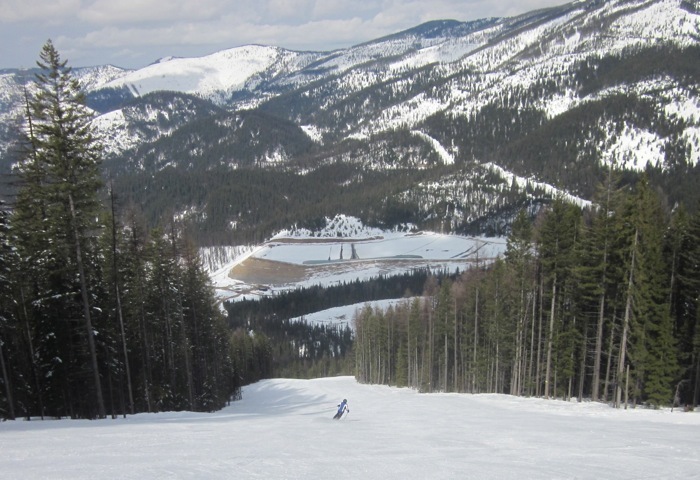 Straddling the Idaho/Montana state line right alongside I-90, almost halfway between Spokane to the west and Missoula to the southeast, Lookout is a proudly old-school ski area that’s also one of the most affordable hills you’ll ever run across. A drive-up price of $39 on weekends and holidays along with $36 during midweek is positioned to make skiing available to cost-conscious families. Given this target audience, Lookout makes no bones about the key role that instruction plays there. For 76 seasons, the area has offered free lessons for kids age 6-17 every Saturday morning. 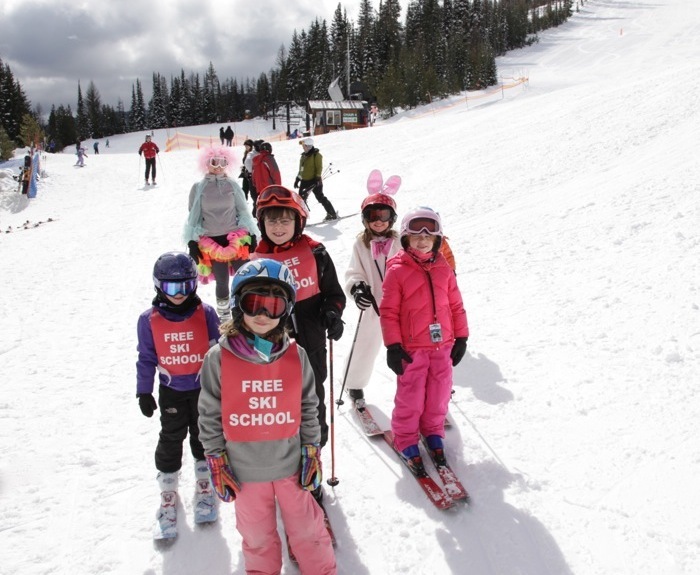 Over that time, Lookout reports that it’s introduced more than 60,000 kids to skiing. Moreover, they’ve brought in an ambitious new snowsports director to expand that legacy. We had a great time cruising the consistently pitched terrain spread across three faces that snakes through the woods, and with the recent snowfall, there were all sorts of goods to be found in those nicely spaced trees. Uphill transport is provided by, what else, an all-Riblet contingent: nothing but center-pole double chairs. In addition, Lookout has some big expansion plans for the near future, including lift service on two other peaks and a new 20,000-foot base lodge. The historic existing structure, the oldest continuously operating ski lodge in Idaho (since 1935), has a pair of clocks to remind you that Lookout — along with Heavenly (California/Nevada), Catamount (New York/Massachusetts), and Lost Trail (Montana/Idaho) — is not only one of few ski areas in the U.S. that spreads across two states, but also across two time zones. With an ominous-looking Pineapple Express only 12 hours away, we had to make a game-day decision and scratch off a visit to Silver Mountain, which, thanks to its four-season resort amenities, offhill activities (including a popular waterpark), and convenient location only a couple minutes from I-90, is a favorite with families. Instead, we skied a mountain that now sits near or at the top of my favorite locals areas list: the uniquely named 49° North. Just like Mount Spokane and Lookout Pass, there are no high-speed lifts or hotels there and nothing more than a pleasant but no-frills base area; however, with 1,850 vertical feet, 300 inches of annual snowfall, and a couple thousand patrolled acres, it certainly doesn’t feel like a hometown hill, at least not the ones I’m accustomed to. After a 70-minute drive north from Spokane, we nailed what turned out to be the best weather of the entire trip with deep blue skies, sun-softened snow, and temps just above freezing. Spread across two big bowls, 49° North offers an impressive assortment of terrain spread across a pair of large ridge lines, including lots of, what else, top-shelf tree skiing. Since 2006, they’ve opened two big new sectors: 500 acres of new terrain in Sunrise Basin and, more recently, 230 acres on Angel Peak on the far looker’s right, both with dedicated lifts. In addition to amount of snow that falls there annually, the fact that the terrain is covered by grass and very few rocks helps it get open quickly, almost always by Thanksgiving. 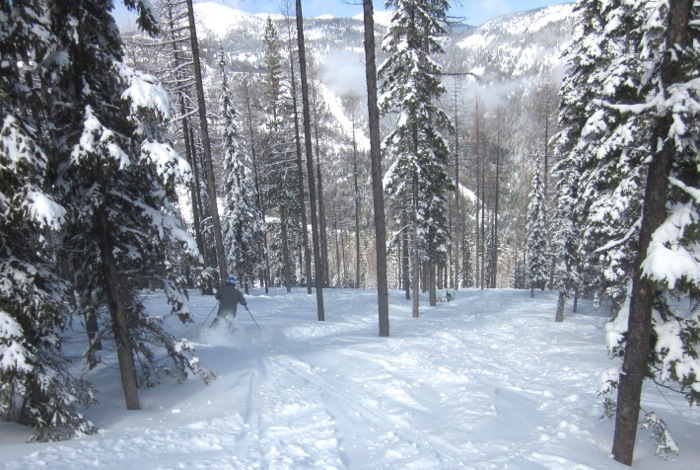 For the 2013-14 season, they opened with several trails on November 17. A few months after our visit, I learned via this informative video how much history the ski area, located on Cheweleh Peak, has in this region. With piles of historic stills, interviews, and footage about the development and ups/downs of the ski area over the decades, it’s a fascinating story of how 49° North began with a rope tow in 1939 and gradually expanded to its current size: the second largest lift-served mountain in the state of Washington. As mentioned up top, I know that many people on this site visit the PNW and often fly through Spokane to hit the Canadian mountains directly north, but you’re doing yourself a disservice by not visiting this entertaining ski area, or for that matter, the entire Inland Northwest region. These photos are stunning, James! Excellent report and pics… My wife and I have been living in the INW for about 4 years. Shweitzer was without a doubt our favorite visit Idaho so far. Have not been to any of the others yet, but based on you report, we will definitely check them out in the near future. If you ever get back to the region, you should also check out Mission Ridge in WA (my home area). Super low key. No hotels at the base. No crowds. Plenty of RV parking. The quantity of snow is not near what normally falls closer to the crest… But the quality is fantastic. Hi Boznuts, I’ve been coveting Mission Ridge via the internet for years and would love to go there. Unfortunately, at 3+ hours from Spokane, it was a bit outside of our reach distance-wise. Next time, I’ll definitely check it out. I have relatives that live in Spokane so I have done this trip except we skipped 49 north and added Red Mt just across the boarder which you would love. Silver is actually quite a good as well with kind of a funky lay out. Schweitzer was my fav in this part of the world. Its exactly the kind of place that I love sort of a ID panhandle version of Grand Targhee was the vibe that I got. Great skiing and a big mountain with no crowds.